A 16-cell L. variegatus embryo, viewed from the side. 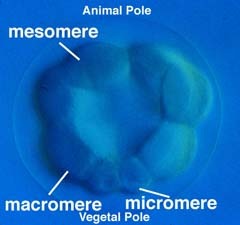 Sea urchins undergo radial cleavage, as do "typical" deuterstomes, such as chordates, ascidians, and other echinoderms. Like embryonic cleavages in other organisms, sea urchin cleavage divisions are reductive, i.e., the cleavages result in more cells, but without an increase in the total cellular volume of the embryo. The next few pages provide representative pictures of cleavage stage embryos, and discuss the mechanisms and consequences of cleavage in sea urchin embryos.